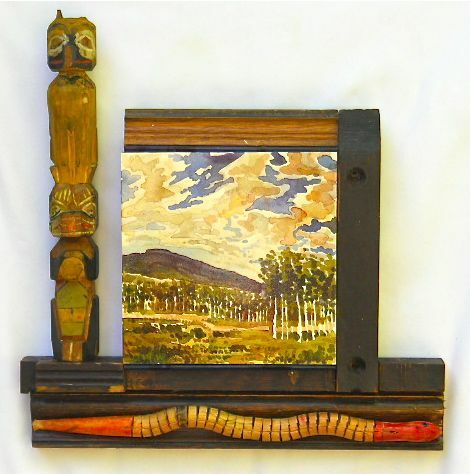 "What Was" watercolor with oil varnish and assemblage. (approximately 10"x10") 2011 The snake I actually bought from the 6 year old son of a friend of mine when he was selling some of his toys on his porch to make some money. He's responsible for the snakes tail and head color, as well as the black section in between- not me. I thought he made good color choices! I Thought I’d post for you more of the “small songs” that were featured for the first time at the Bellevue Festival for the Arts. See the earlier post on July 28th for more info about these. I had a great time creating these works playing with the exterior/interior aspects of the work. Enjoy! 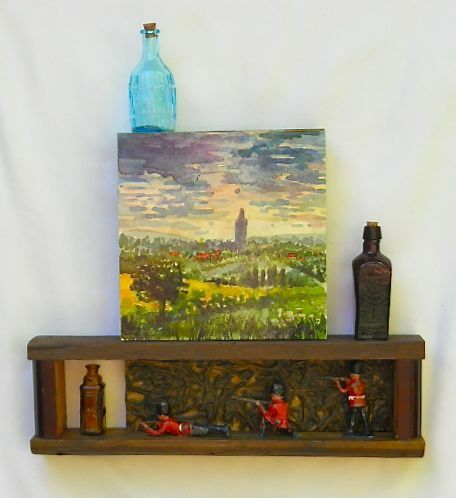 "Middle England" watercolor on wood with oil varnish/assemblage. Aprox 8"x8" 2011 I painted this in a train traveling from London to Bath. The women next to us in the train got progressively drunker throughout the trip (downing between four our them I believe about three bottles of wine). When we got off the train in Bath one said to me "Oh look there, you painted that nice painting on the train, and all we go was pissed!" "Lion and Lamb; Bath, England" watercolor on board with oil varnish/assemblage Approximately 12"x 9," 2011. I was struck at my luck when I found the tabacco tin in a junk shop in Amity Oregon, and felt like it was a dead on match. The hand is actually from a saint and was bought in Belgium. For this one I sat out across the street in a garden next to a church to lay out the initial image for a half an hour or so. 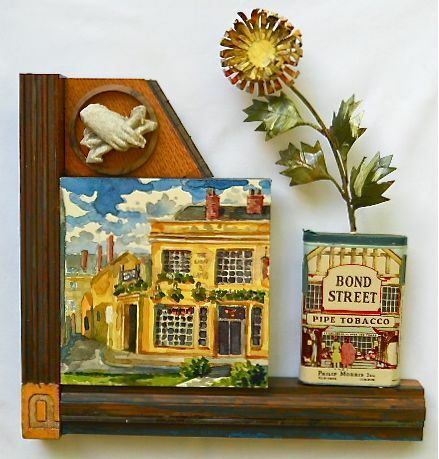 This entry was posted in Art in the Works and tagged art inspired by England, assemblage, images of Europe, plein air painting, watercolor on board. Bookmark the permalink. I’m even sorrier now that we missed this show!